A window cleaner who voluntarily spruces up road signs says he has been overwhelmed by the response to his work - which included calls for him to be knighted. 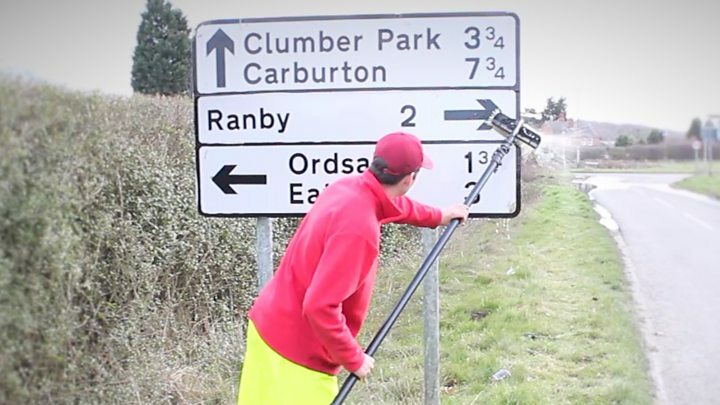 Liam Wildish spends his spare time out with his brushes cleaning signs to help motorists drive more safely. Dutch DJ Tiesto was one of the many who commented after millions saw a video of Mr Wildish's exploits. The 21-year-old said the reaction to his efforts was "phenomenal". Three million people have viewed the video on Facebook of Mr Wildish's handiwork since it was published on Wednesday, with a further 1.7m viewing it on Instagram. In it, Mr Wildish said he had recently started a window cleaning business and had voluntarily started cleaning road signs, particularly in areas around schools. "I like to think it improves safety on the road," Mr Wildish, from Retford, Nottinghamshire, said. He said the online recognition he had received had been "amazing and stressful at the same time", with people from Australia, Germany, Mexico and the US among the well-wishers. "I don't want to call it fame, because I'm a bit humble, but the publicity is phenomenal," he said. "Every five minutes cars are beeping at me and people are waving as they go past. "Tiesto commented saying I deserve a knighthood - I feel like I've been knighted already just by him saying that." Mr Wildish added he had no intention of stopping his selfless scouring. "People have offered to set up fundraisers and community work," he said. "Hopefully it will inspire people to make changes." Writing on the BBC East Midlands Facebook page, Karen O'Connell said: "If only everybody respected their community, we wouldn't have to live in a rubbish tip, well done young man." Susan Gethin wrote: "He deserves an OBE or something similar." Social media comments about Mr Wildish's work include people saying they would vote for him as prime minister, asking if some of their council tax can go straight to him, and calling for him to be knighted or made an OBE. John Mann, the Labour MP for Bassetlaw, backed the calls for Mr Wildish to be honoured. "We should celebrate community activists and their commitment to making things better for us," he said. Image caption Nottinghamshire County Council said it "applauds Liam for this public-spirited approach"